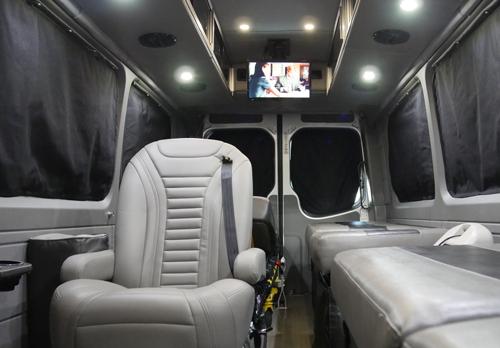 Our customized Mercedes Sprinter vans are equipped to meet your needs and ensure the most comfortable ride to any destination in the continental U.S.
ACC Medlink transporters are the only DOT approved vehicles in the entire industry for this type of transport. 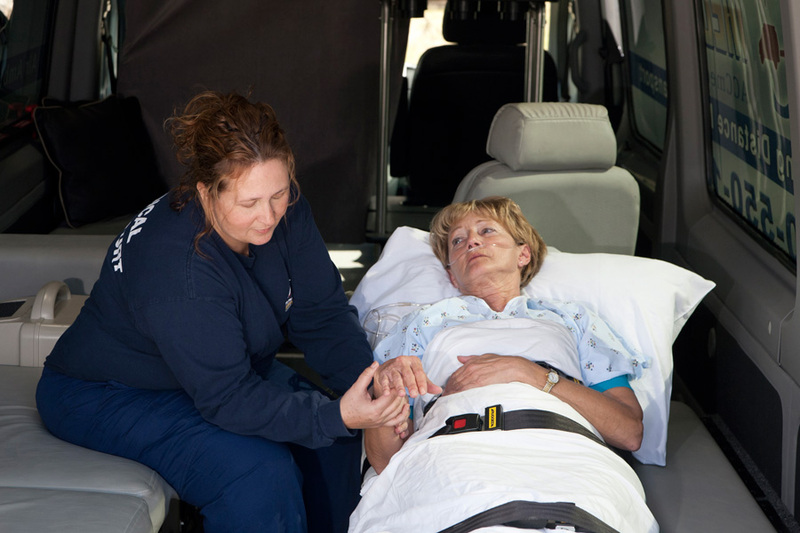 For patient privacy, our vans are equipped with tinted windows and blackout privacy curtains. 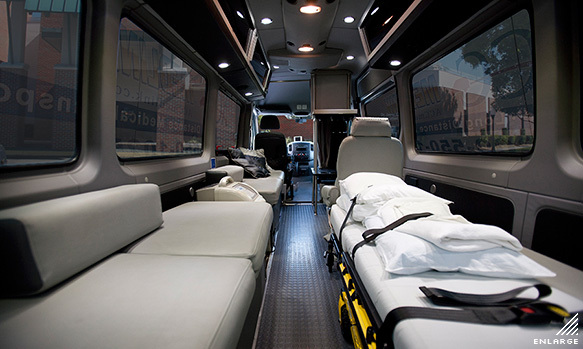 Our Mercedes Sprinter is built to allow the patient maximum comfort. 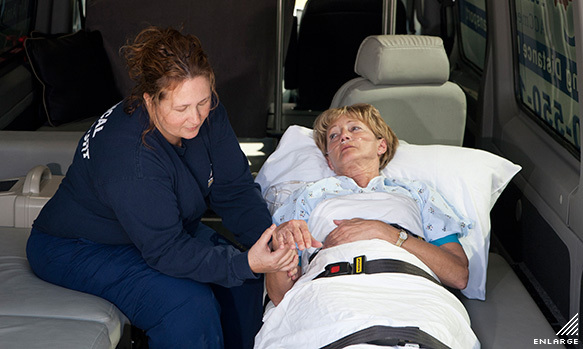 The state-of-art design makes our long distance ambulance service the industry leader. 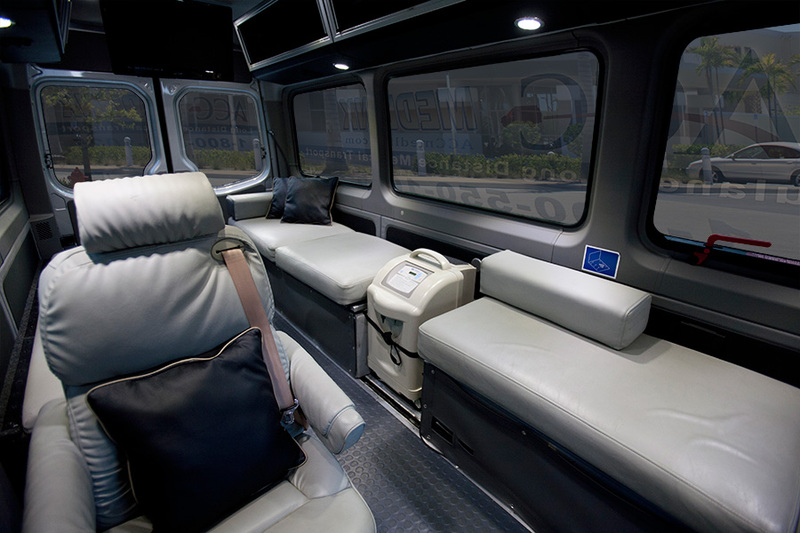 Our Sprinter is the best combination of luxury and value for patients traveling with additional family, large medical equipment or even pets. Our service is very accommodating, we will take care of any special needs you may have. Just inform one of our transport coordinators and they will be happy to assist you. 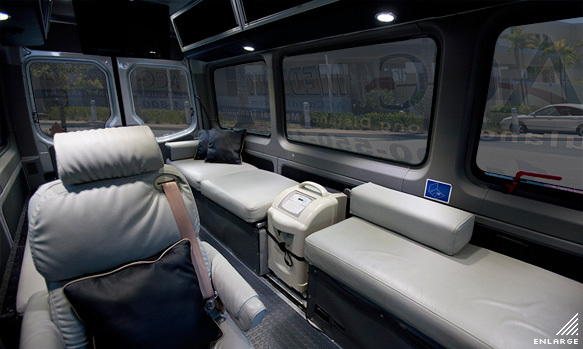 Our Sprinter series transporter provides the most inviting interior for patients to settle into and makes our medical transportation fleet second to none. Lots of room for family and pets. Extra beds for family. Our mattress is the most comfortable in the industry. 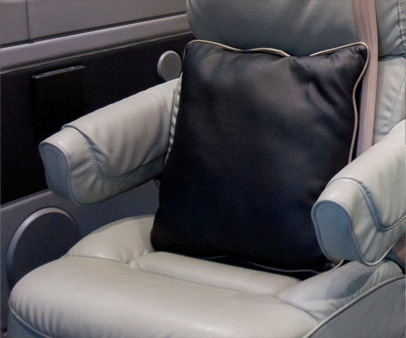 Plush captain’s chairs with dual armrests for the ultimate in luxury. 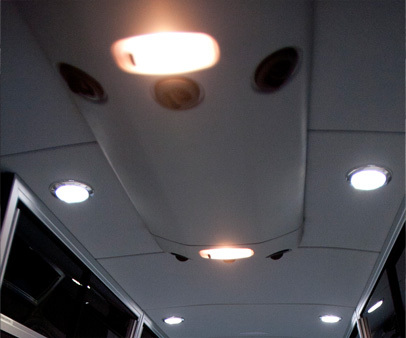 One of the reasons that you chose a luxury transportation service is for the privacy. 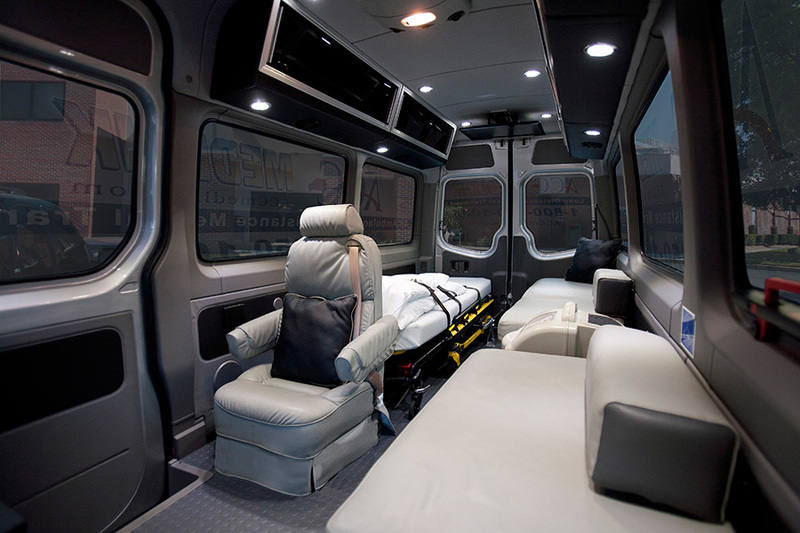 ACC Medlink understands this, and as a result, each one of our luxury transporters comes with tinted windows and blackout privacy curtains. The tinted windows enable you to see out, while providing a safe, secure, and private experience en route to your destination. The blackout privacy curtains block out sunlight and harmful UV rays, and allows for resting in the day. When driving to your chosen destination, we want to ensure that you are as comfortable as possible. 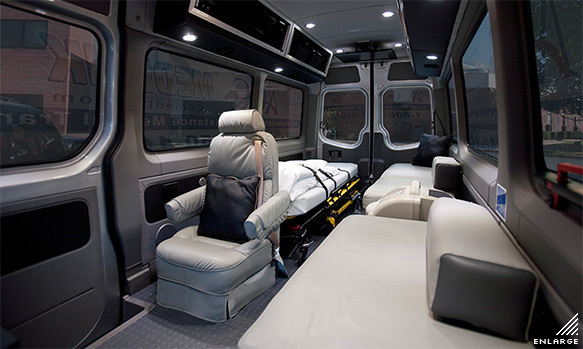 This is why each and every one of our Sprinter med transporters has only the finest upholstery and interior. We take your expectations of a comfortable, luxurious ride very seriously, whether you are traveling across the state or across the country. The western desert sun can be unforgiving, as can the winter cold in northern climates. 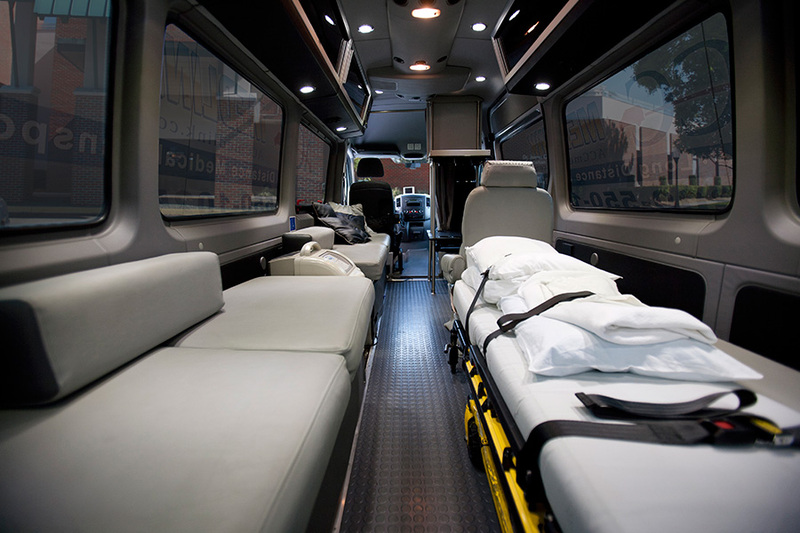 ACC Medlink makes sure that you arrive to your destination comfortable and relaxed thanks to the top of the line air conditioning and climate control systems present in each of our luxury transporters. Also, if you’re carrying a good book, overhead and reading lights go up when the sun goes down. 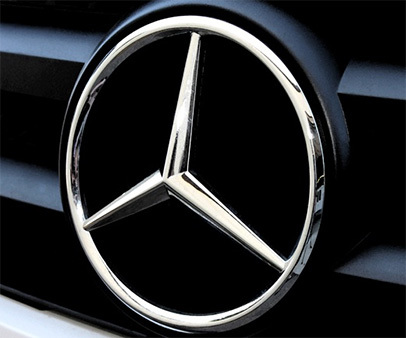 Our vehicles are chosen for their discreet balance of luxury, performance, and reliability. Stocked with amenities, our transporters are immaculately maintained according to regular schedules and are insured beyond all state and Federal requirements for a transportation service. All vehicles are equipped with GPS navigation systems, cell phones, DOT approved safety restraints, fire extinguishers and first aid kits. Every one of our Mercedes Sprinter transporters comes equipped with a state of the art flat panel TV, DVD player and WIFI internet (available upon request). Relax on the way to your destination with your favorite movie. If you have a laptop, tablet or smartphone with you, take advantage of WIFI (available upon request) during your ride and keep in touch with friends and family. Our high quality TVs, DVD players and WIFI internet ensure that your ride is as entertaining as possible.